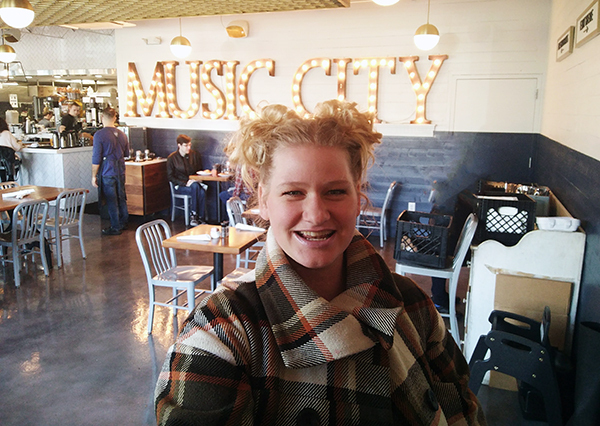 Of all the fabulous places to eat in Nashville, one of our favorites was a breakfast dive called Biscuit Love. It’s located parallel to Pancake Pantry which typically gets all the Nashville love, but because the line was shorter we opted to fill our tummies here. Plus, Biscuits. And, Bonuts. As if the lines weren’t proof enough of what was waiting inside, Biscuit Love has exceptional reviews. The line moved quickly enough, and soon we had ordered and were sitting cozily on the upstairs row of seats. 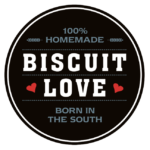 Biscuit Love is a casual dining restaurant where you pay before you dine and seat yourself. The restaurant is large, but cozy, with three main eating areas. The kitchen is visible, with bar seating, even though it’s just breakfast and lunch hours. There is a large lit marquee on the back wall spelling out everyone’s favorite destination: Music City. The menu is segregated by, you guessed it, biscuits. There are four sections: to share, with a biscuit, without a biscuit, and for the little ones. There is also an a la carte option, and an entire menu of drinks. I came for biscuits, so you can guess what I chose. All. The. Biscuits. In fact, I couldn’t resist two of the three items on the to share portion, and I left completely satisfied, from just one item on the menu. Hands down, my favorite thing at Biscuit Love is the Bonuts (pictured above). 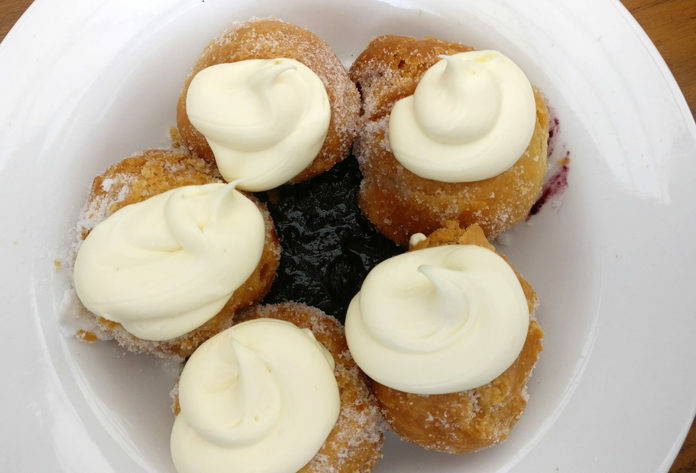 These are deep fried biscuits shaped as donut holes and topped with lemon mascarpone, coated in sugar, and dipped in blueberry sauce. I wish I had ordered these all to myself! The order came with five which means I only got to indulge in two and a half. When we were leaving the restaurant, I was shocked that another table had left some behind and I was tempted to steal them atop all the dirty dishes. I also couldn’t resist trying the Gertie, another item on the to share portion of the menu. 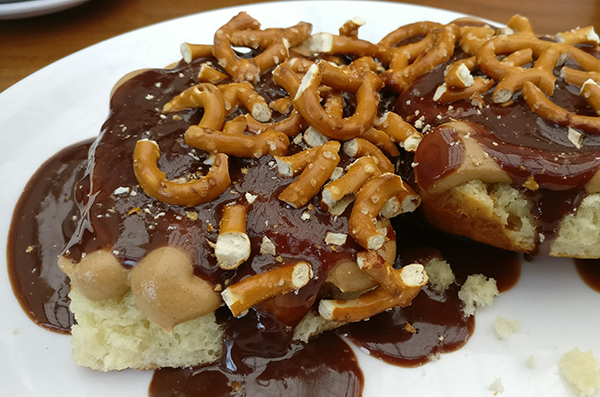 These are biscuits covered in chocolate gravy, pretzels, peanut butter, and caramelized banana jam. We learned that this item was created by the owner’s six year old daughter, but possibly prepared by as well. It was not palatable. It is way too heavy on the peanut butter, so thick it is nearly impossible to chew. The banana jam isn’t even recognizable, and the pretzels are huge. This dish needs a total makeover. Instead, create a chocolate peanut butter gravy topped with caramelized bananas foster, and crushed pretzel pieces. After all that sweetness, I wanted something more savory so for the main entree I tried the Southern Benny. 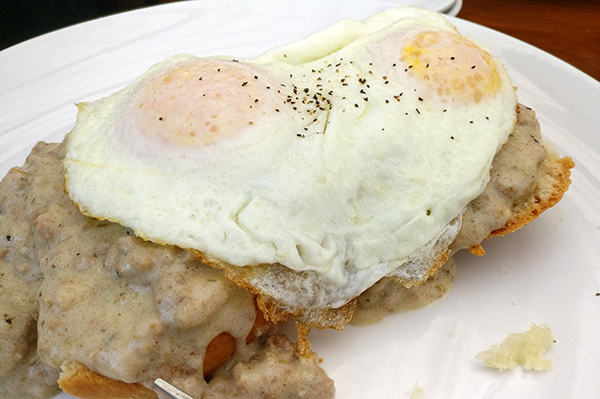 This biscuit is covered in shredded ham, eggs, and sausage gravy. The ham combined with the sausage was conflicting. What it really needed was a big slice of melted havarti cheese instead. ► For Kids: This is a nice down to earth restaurant with a lot of options. Kids are sure to love the sweeter side of things, plus biscuits. We can’t say it enough. Don’t skip the Bonuts. This is a fun restaurant, but when it comes to the food they definitely excel at the sweeter side of things versus the more savory. 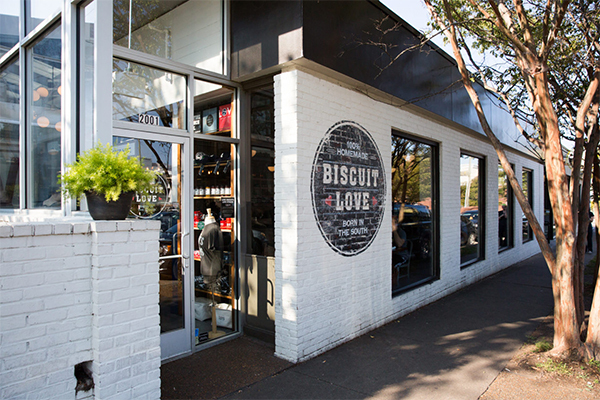 Have you ever eaten at Biscuit Love? What about Loveless Cafe or Pancake Pantry? We’d love to hear which one is your favorite! We’ll definitely have to head back to try all three, but most importantly, eat more Bonuts. ► Nap-Time Version: Family restaurant review of Biscuit Love in Nashville, Tennessee. The Bonuts are everything. Check out the other fun things we did in Nashville including The Grand Ole Opry show at the Ryman (coming soon), and Jack’s BBQ!